For some reasons, we have been unable to accommodate any guest from overseas at our inn for a while. If you want to come over to our farm for fruit picking and stay for overnight, please find any accommodation by your own. There are several inns and hotels nearby our farm and also a lot more in Kofu area. you can come over and visit us. Farm stay video from UWC in Hong Kong. Project week 2015 Nakagomi Orchards Japan. Li Po Chun UWC presents Nakagomi Orchards Album. Farm stay during 9-14 March 2015 in Yamanashi, Japan. Please feel free to watch!!!!! This is our new inn. Nakagomi Orchard's inn & Farm Stay Program I can be your English speaking guide while you are staying at the inn and when you are enjoying fruit picking on the farm. In addition, if you want, I can be your lecturer and talk about Japanese farming issues at night for free over having dinner or tea. That way, your trip can be a lot more meaningful, I believe, since most of our customers are from city areas. Location It is located in a very quiet, peaceful area and is only a few minutes' drive from our fruit farm. The inn is surrounded by orchards, vege farm and rice fields with mountains nearby. You can see Mt. Fuji and the Yatsugatake Range very clearly on sunny days. Accommodation The house has a traditional Japanese style with a nice Japanese garden. Only 4-5 rooms can be provided for our customers to use right now.They are mostly tatami mat rooms. Therefore, if you make your reservation in advance, it would be much appreciated. Farm Activities Besides just staying when you come over for your fruit picking, if you want to join our farm activity, you are welcome mostly all year round. You can have an experience working on our orchard or vegetable farm for a few hours if you want. Getting here If you are arriving by Highway Bus from Shinjuku, Tokyo, I can arrange a pickup from Shirane IC West bus stop if my schedule permits. Dinner will be yamanashi cuisine at one of the local restaurants that are affiliated with Nakagomi Orchard. I might be able to provide you barbeque on the farm if you prefer. We have 18 sets of barbeque grill right now. Each set can be used by 5-8 people on our spacious farm with nice view. Then, even in the evening under the light of lantern, our customers can enjoy having barbecue for their dinner. Or possibly, I hire professional cook and he/she can cook and serve nice meals at our dining room. Joining our farming activity If you are interested in joining us with our farming works, please let me know in advance. I might be able to create some simple and basic works for you. 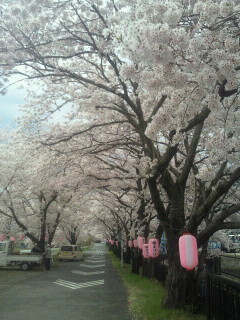 Right in front of our inn, we have an avenue of Sakura trees. They are usually in full bloom around April 10-16. From this same spot, you can enjoy seeing Mt. Fuji. 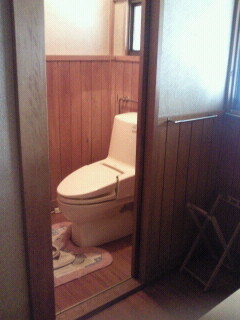 Japanese high-tech toilets are installed in the house and also outside. The view that can be seen from our second floor. From June 2011, I will be starting Japanese small inn, "Minshuku". On our farm, many customers from overseas have trouble finding accommodation when they come over for fruit picking on our orchard. 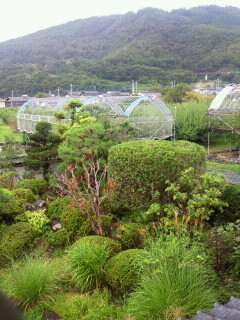 Therefore, I decided to buy a Japanese style house surrounded by farms. Customers from all nationalities are welcome to stay overnight at our inn and enjoy fruit picking or farm activities if they like. The inn is located on a peaceful & quiet area surrounded by lots of high mountains with nice views of Mt. Fuji, Yatsugatake Range and Japan's South Alps. If you would like to go hiking, nearest hiking spot is only 10 minutes away on foot. you can bring your hiking gear if you intend to go hiking.. In this area, there are 15-20 nice natural onsen located just minutes away by car. I may be able to drive you there, depending on the schedule. *This is one of the nicest Japanese houses in a town, I believe. The location is also in very good environment surrounded by the nice view of Mt. Fuji, Yatsugatake Range, Southern Alps of Japan. There is no house around at all, surrounded by rice fields and fruit farms all over. *In case we set up barbecue for your dinner, we have to charge you additional 2,000 yen for each person. Then, you can enjoy barbecue under the light of lantern on our BBQ site. I can hire professional chef and let him/her cook very special meals for dinner at our inn. In this case, I charge 15,000 yen per person including this dinner, simple breakfast and taking you to local onsen. Please present their passport upon check-in. Or I might be hiring professional chef and let him/her cook a very nice dinner for you here at our inn. The fare includes dinner, simple breakfast at home, onsen fare and transportation from local bus stop to our inn, inn to our orchard, orchard to inn, inn to onsen, onsen to local restaurant,restaurant to inn and inn to local bus stop next morning. Also, the fare includes the services of an English speaking guide while you are staying at our place. The admission fare for fruit picking is not included. *At public onsen, make sure that you have to be all undressed. If you hesitate to go there, then we have a bath/shower at our inn. In that case, the fare will be the same. This is NOT ordinary inn or hotel, but my private second house and I use it as inn based on lots of visitors' requests. Please follow Japanese way of manner while you are staying at our inn or on our farm. Unfortunately, some visitors from overseas have caused troubles & frictions in their manner so far, mostly because of their lack of the sense that they should have while staying here in Japan. As proverb tells us, "when in Rome, do as Romans do", please follow Japanese way of manner. That also can teach you how Japanese way of life is while you are staying here. * Only cash payment (Japanese Yen) will be accepted at our inn and farm for fruit picking activities. Credit card and checks will not be accepted. I'll put more information abouti our new inn later. Please wait some more.